• Earth Observatory (NASA). So much goodness here. I'm sure every teacher already has this site bookmarked. • Visible Earth (NASA). 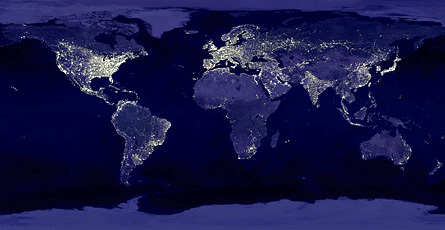 This is a new collection of earth imagery from NASA. I particularly like this photo below. Amazing! Click on the image to get a much larger size. • Great Images in NASA. A collection of about a thousand images of historical interest scanned at high-resolution in several sizes. • NASA multimedia. Includes many high-quality photos as well. • Photos by Astronauts. A gazillion cool images from space. • NOAA Photo Library. Search the site or browse through "collections" at the top. Hundreds and hundreds of historical photos in there too. • Uncle Sam's Photos. A directory of the U.S Government's free stock photo sites. • The (US) National Archives. The National Archives has more than 30 million photos stored in several buildings in the US, many of them are available online. High-rez photos of The Constitution and The Bill of Rights, etc. as well as loads of photos from WWII in general and Japanese American Internment, and so on. I think I have seen some of the WWII images in Ken Burns' s documentary The War (highly recommended). 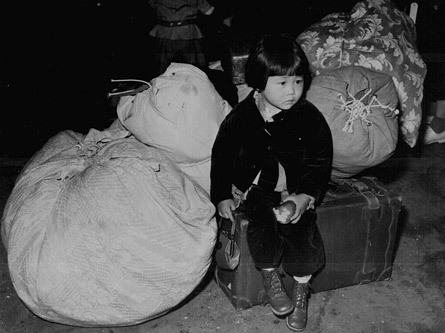 A young Japanese American waits with the family baggage before leaving by bus for an assembly center in the spring of 1942 (National Archive source). • WWII posters. Not too many high-rez images here, but very interesting. Sizes may be good enough for slides. • Public Domain Pictures. A repository for free public domain photos. Easy to search. I love this one. This may seem like an odd potpourri of links, but these are sites from which I have been gathering images lately and just thought you may be interested for future reference. If you know any other public domain sites that offer good quality in the form of historical archives, etc. please share your links in the comments section below. Much appreciated.